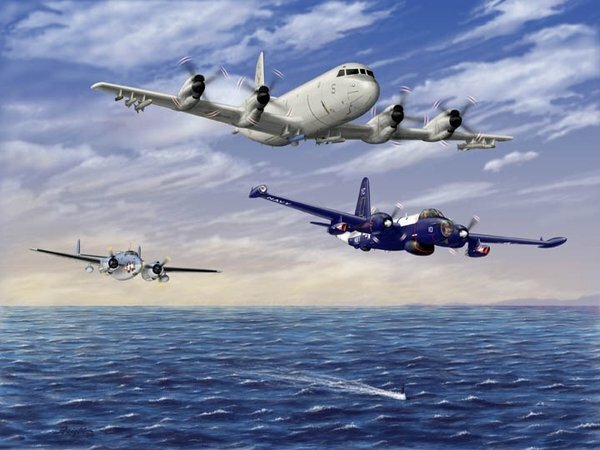 This spectacular new digitally airbrushed print from Don depicts the history of the Lockheed land-based submarine hunters. The line of Anti Submarine Warfare (ASW) patrol aircraft began during World War II with the PV-1 Ventura (left) which was based on the Hudson bomber being built for the British. At the end of the war, the P2V Neptune (right) was designed from the ground up for the specific purpose of ASW and flew during the late 1940s all the way into the 1970s. Finally, the Electra based P-3 Orion (top) is shown in the latest version that is still in operation around the world today. A limited edition of 500 printed on 100% acid-free cover stock.